This is my first day in school for 3 days because I have been doing stuff. Yesterday I was in Hereford and was lining up to see the Queen. It was not very good because the Queen was in her car and she was going at 2mph. So I am very sleepy and grumpy. The school lunches are not very good and they can put people off their food and sometimes it is the best ever. My favourite is the school soup and apple pie. Today is the new lunch menu and it's the pasta. 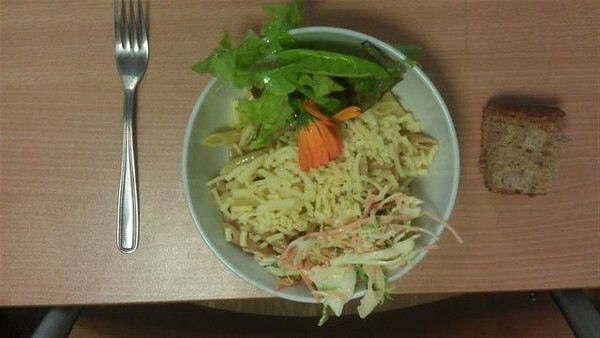 Pasta with garlic butter and cheese coleslaw and salad. Cake a bit dry. Every week is the same menu I think that is boring. Mouthfuls 25+ it was too much for me to eat it all. It cost £12.50 a week for my dinners and only £10.70 for Mary's Meals to feed a child in school for a whole year. Thanks NAH. Veg here. Cake without a plate? That rhymes! I have seen things that make me smile today. First I saw my friends new calf in the sun. It was really cute and jumped and played. Then I watched Dad paint our naked sheep with tar. Naked sheep are funny because their lambs don't recognise them. The tar covers cuts to stop flies. I wanted to show you my lunch that makes me smile. I think it is very Scottish. It is a macaroni cheese pie! Do you have pasta pies like these? I used the microwave to heat it for 1 minute. The pastry goes soft that way. I don't have them very often and Dad showed me the packet. Can you help me give it a health rating please? My radio guests sent me a rating for my soup they tried. I'll tell you about it tomorrow! A "very Scottish" lunch? Then you should call it a "MacAroni Cheese Pie". Welcome home dragon hunter NAH! Been looking forward to your reports. I have to say I like the looks of Veg's 'MacAroni' cheese pie more than your school lunch. Your lunch may be healthy but it is remarkably unappealing in presentation. Sometimes massive amounts of carbs, sugar and fat can make you feel wonderful enough to overcome an occassional "unhealthy" lunch. My doc says it's okay on a rare occassion. I don't disagree. Hope your lunches at least start looking better. I have never Had macaroni cheese pie but it looks very good!! I love your blog. I am in Baton Rouge, LA, USA. Wonder how long it would take to find that?? Dragon hunter or should we call you Not a Hippie, indeed welcome back from your adventures and quests. After such a grueling week so far, I would have expected a slightly better meal for your heroic return. More so as the queen only went 2mph in her car, she was lucky not to get a ticket going that fast. I will drive that slow tomorrow to work, if my fuel economy improves and it is good enough for the Queen, then it's good enough for me. Trouble is it will take me 6 hours to get to work - how many miles? Apple pie - something every dragon hunter deserves. Get some rest and maybe tomorrow the menu will yield better rewards for you. Macaroni cheese pie - ooh, you are also brave VEG and you both deserve medals for your endurance's this week. Macaroni cheese - that is one substance I refuse to eat. It looks nice but the taste and texture deceive, but I love all other types of pasta - even with cheese sauce, work that out? Health rating 4/10 - too much saturated fat for my (not) liking (macaroni cheese). Great posts NAH/VEG, really enjoyed the read!! It is a very scottish meal. 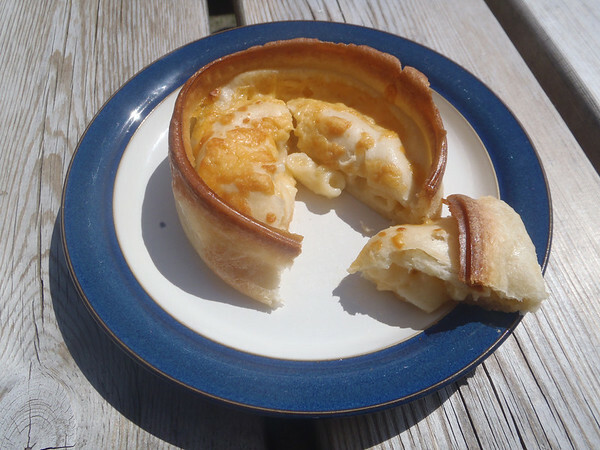 I've never had a macaroni pie, despite being 20 and scottish. I'm ashamed. I would say its got to be like a 5/10 for health. The vegetarian lunches do not appeal at all. I prefer VEGs lunches because they remind me of my time in school. Love your blog. Veg that pie looks very nice! Where did you get it from? I could devour one of them no problemo! Welcome at last NAH finally glad to read your own work! I must admit your meal today doesn't appeal to me but I'm glad you enjoyed it! Oooh...that macaroni cheese pie looks fabulous! What a great way to serve it with a pastry dish like that. It reminds me of the pot pies I had while growing up which were basically a pastry shell filled with a creamy chicken and vegetable stew. Very rich, but very delish. I'll have to see if I can find a recipe to do the same with mac & cheese. And "Not a Hippie's" lunch sounds like an interesting combination. I would have never thought of pairing coleslaw with pasta, but that might actually be good. Especially if the pasta was cold, like a pasta salad. Could be quite refreshing. Macaroni cheese pie sounds amazing! NAH, your lunches must be very boring. For a school that appears to allow children more choice, they are clearly failing with the school dinners. £2.50 is a lot of money for what you are getting. 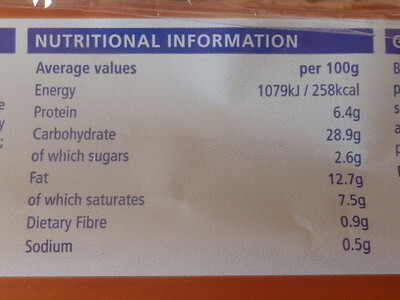 Those figures are per 100 grams, 0.5g of 'Sodium' under most normal circumstances sounds like a lot to me, not much fiber. But as with all food, you need to consider more than just that one meal,. You need to think about what you have been doing and eating. cant believe its been 2 weeks already!! my kids are getting a little bored of all this rain, fingers crossed it drys up in time for the fringe festival! Hello, Not A Hippie. I thought your food looked lovely. Really glad you liked it! Hope you get some sleep and feel less grumpy for tomorrow. VEG - that pie looks gorgeous! I want one! Sounds yummy!! It all looks so nice! Not A Hippie, I think your dinner looks quite nice today! But then, I would probably get bored if I had as little choice as you. I'm a really fussy eater, I need lots of choice! VEG - I love hearing about calves and lambs! I've moved to the city for University, and I really miss the countryside. Your pie looks amazing. I really really really really really really want one now. I don't know much about healthy eating (I like yummy food...), but I think that pie looks a little too rich to eat too often. I had garlic mushroom pie yesterday, and I'm still full from that pastry! Welcome Not A Hippie, interesting to see you both had pasta and cheese for lunch! Was Veg inspired by yours, I wonder? In New England a farmer's breakfast could include hot apple pie with cheddar cheese on it. It is delightful, I hope you give it a try! I love macaroni pies! Yours looks delicious. I've never seen them on sale down here in England but when I visit my family in Scotland I always try to have one. That or a chicken curry pie. Macaroni pies are not very healthy - maybe a 4/10 - but it's ok to eat something a bit unhealthy if you mostly eat healthy things. 8 grams of saturated fat. Yikes! Not so good.